The New Year is quickly approaching, so it’s likely you’re cataloging items to close out this year and begin anew in 2018. We’ve got one item that should be on your latest to-do list: get active on LinkedIn. Social media was once an afterthought for busy business executives. While it still may be for many – it’s time you took advantage of the world’s largest professional networking site. 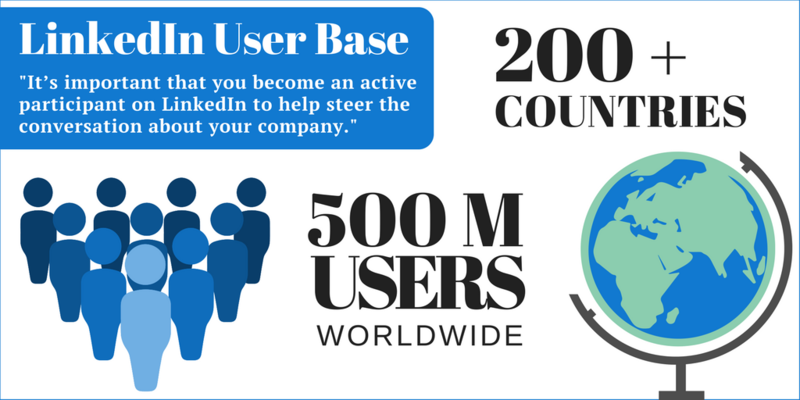 With a user base consisting of 500 million people from more than 200 countries, it’s important that you become an active participant on LinkedIn to help steer the conversation about your company. Get your executive profile in shape: Having a complete profile is important to show you’re an active participant on the platform. Pay special attention to your profile picture – use a professional headshot that is friendly and aligns with your leadership role. Make sure your LinkedIn headline is relevant and specific to your industry. Does it speak to the audience you are looking to connect with? Does it include keywords of your product/service and expertise areas? Build your network – connect with your customers, partners and peers: Your customers are on LinkedIn, so make sure you connect with them to remain top of mind and to provide them necessary attention. The same goes for your valued partners and peers. Stay up-to-date on your contacts’ movements, interests and needs – in real time. Demonstrate your thought leadership: LinkedIn can help you become a voice in your industry and it’s easy to do so by sharing company news, online articles that piqued your interest, personal insights, corporate presentations, relevant industry news and more. According to the platform, nearly 2M unique publishers actively share content – so users look to the site daily to review their newsfeeds and read about leaders and companies they follow. Don’t be afraid to leverage LinkedIn features: One that we love is LinkedIn’s publishing platform. You can use it to publish posts that share professional insights and provide value for your network. Active participation in LinkedIn Groups is also key. These groups help you and your business network with other professionals in the same industry, especially those outside of your immediate circle. Beyond these tools, LinkedIn offers many tips and insights to maximize your presence on the platform (check them out here). So what’s keeping you? Taking just a few minutes a day can help pave your path toward becoming a social leader. Employing the tactics above will allow you to reap many of the benefits LinkedIn has to offer.